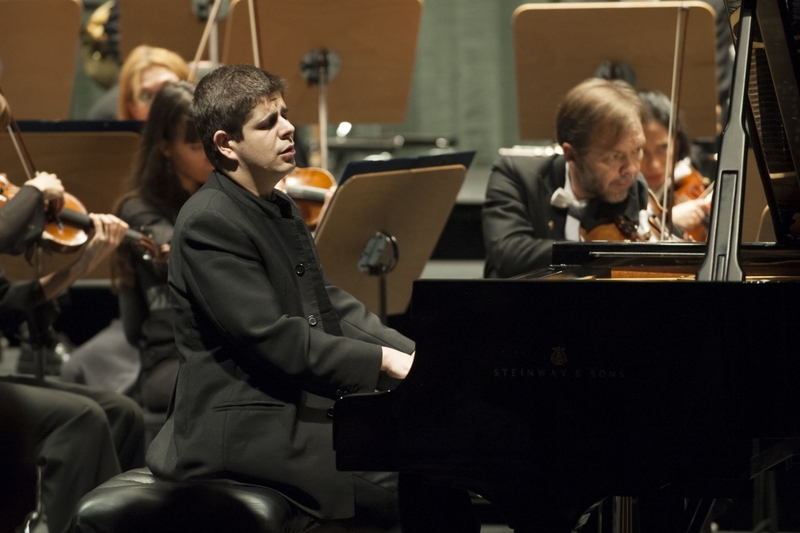 On the eve of his Australian tour, the Spanish pianist explains why he hasn’t yet decided to be a professional musician. Growing up in Spain, what were your first musical memories? I’m from a very, very little village in the south of Spain, and I think my first musical memory could be from the big band in my village or maybe from some concerts in nearby village by some Spanish pianists. But I remember concerts in Seville by Radu Lupu, Krystian Zimerman, Maria João Pires and Gregory Sokolov – that level of pianist – when I was a student. Was there a lot of music around when you were growing up? Not in my village. The tradition was closer to big band music – clarinet, saxophone, those kinds of instruments. But Seville was one hour from my village and there in the Conservatoire they had an orchestra and in that time we were receiving visits from big name pianists. It was encouraging for me to have the opportunity to see those giants, legends of the piano. I understand you initially wanted to play the clarinet. What convinced you to switch to the piano? I started with the piano when I was eight and the summer before I started, I was deciding to buy a clarinet to start lessons on that. But one of my aunts – she was teaching piano at the Seville Conservatoire – showed me a big piano in the hotel where I used to spend the summer. And when I listened to that beautiful and amazing sound, I told my father and mother, “OK, I would like to change my opinion. I think it would be great to start with this instrument.” The instrument was like a big orchestra, all the different sounds and colours at the same time – I think that is what captivated me. Was there a moment growing up when you decided you wanted to make a career out of music? I think that I have not decided yet. I’m kidding of course, but there’s not been that kind of break point where you have to say, “I want to be a professional pianist.” It didn’t happen in my life. I think everything has been the result of some kind of natural process. If five years ago we were having this conversation and you were telling me, “Javier, you’re playing the next season with the Boston Symphony, with Chicago, with the Cleveland and New York Philharmonics, London Symphony and Philharmonic, and you’re going to do a big tour in Australia with four different Australian orchestras.” I would say, “You’re kidding!” But it’s happening, and I need to believe that this is part of some kind of natural process and nothing else. I would prefer to enjoy that way of seeing my life – step by step. When people ask me, “When did you decide to become a professional pianist?” I always reply the same: I have not decided yet. Were you ever tempted by any other careers or any other callings? No, but I have been a big fan of journalism. If you asked me what I was thinking about besides being a pianist? Possibly being a journalist. I am a big fan of information – sport journalist, political journalist, whatever. You’ve recorded a lot of traditional Romantic repertoire – Schubert, Mendelssohn, Beethoven – but you’ve also recorded a lot of music by Spanish composers. What attracts you to the Spanish repertoire? I don’t feel any kind of obligation to record Spanish repertoire because I’m coming from that culture. I’m recording the music that deserves to be recorded, the music that I really love. I’m talking about Blasco de Nebra, Falla, Granados and Turina. I’m recording this music because I truly believe that this is international repertoire. In the next couple of seasons I’m doing Bartók with Munich Philharmonic, I’m doing Ravel with Orchestre de Paris, I’m doing Schubert for solo piano. Of course I’m going to do more Spanish music in the next seasons, but it’s not an obligation, it’s more a vocation. Your most recent CD features the Granados and Turina Piano Quintets. How did you decide to pair those two composers? There was not a single recording by a Spanish quartet and a Spanish pianist playing Turina and Granados. The Quintet was the first piece that Turina composed, ever. And he was influenced by the Paris school of César Franck and, of course, Debussy, all those composers had a big impact on him. After the premiere of this piece, the Spanish composer Albéniz and all Turina’s good friends proposed to him, “OK, it was a beautiful piece, thank you and congratulations, but why don’t you change your perspective and do some more folkloric music – more connected to Spain?” And Turina completely changed the language forever. So this is a perfect example of a young Spanish composer looking ahead to the future and at the same time looking back to the past. In the case of Granados, this is Opus 49 so he was more evolved. But curiously the piece does not have much resemblance to Goyescas or other pieces by Granados for solo piano – it’s absolutely more developed and more interesting. We thought, “They’re two masterpieces for piano quintet by international Spanish composers, why not record them together?” It’s crazy to think that this was the first time a Spanish quartet and Spanish pianist recorded this combination. You’re playing Beethoven’s Third Piano Concerto first up in Australia. How would you describe your relationship with this work? Beethoven’s Third Piano Concerto was the first piece that I played with an orchestra. You can imagine my relationship with this piece. It was my first Beethoven concerto, with the Jaén Orchestra in the south of Spain, and I have great memories. I was 17 or 18 years old – so we’re talking about 20 years ago – so of course the piece has changed, has developed. I have a different perspective, but still I would like to keep that fresh performance of the piece. You’re playing a wide range of repertoire on this tour: Beethoven’s Third in Perth, Grieg in Hobart, Bartók’s Third in Auckland, then Saint-Saëns’ Fifth in Brisbane. What are some of the challenges of playing so many different concertos back-to-back? It’s more exciting to do different repertoire – of course it’s challenging for a pianist and a musician, but in the professional world we’re doing this all the time. I was playing last week with the Cleveland Orchestra and New York Philharmonic, doing two more different concerts. I was doing Ravel in G Major with Cleveland and de Falla’s Nights in the Garden of Spain with New York, so adding to this four weeks’ we’ll be talking about six different concerts in six weeks. This first week with the Western Australian Symphony Orchestra is going to be with the wonderful maestro Simone Young and it’s a great pleasure to start my Australian tour with this beautiful and great orchestra. I’m really looking forward to all this tour, because it will be a challenge to shift all the repertoire between one orchestra and another, but at the same time it’s going to be a beautiful trip in a wonderful, huge country. My previous visits have always been to Queensland, with the orchestra in Brisbane, and now I have more chance to develop relationships with the other Australian orchestras. I’m ready for Beethoven’s Third, and I’ll think about next week (it’s going to be Grieg), next week. Step by step. So it’s challenging but at the same time I’m really looking forward to it. Bach and Glass make a pair of interesting musical bedfellows. Piotr’s heart of Mozart: Polish pianist plumbs the depths in a couple of Classical masterpieces. We asked seven of our leading maestros which underrated composer they would like to be conducting, given half a chance. Polished Bruckner and beatific Beethoven from Simone Young and the SSO.